We spent over 40 hours researching and testing 15 different types of baby jumpers and found that stability, brand reputation, and easy storage were most important. 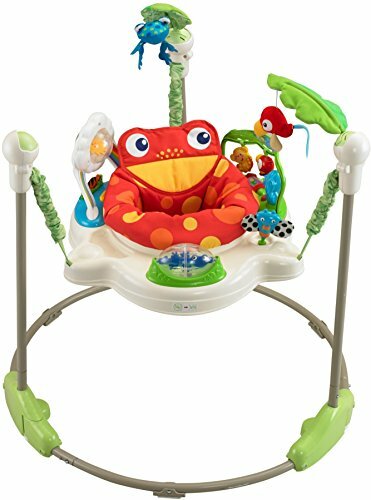 The Fisher Price Rainforest baby jumper scored high marks in all the categories and is our top pick. The soft spring covers prevent any pinches from occurring while the baby is in the jumper. There are three height levels to choose from so the jumper can grow with your baby. The convenient frame opens at the top so the baby is easy to get in and out of the seat. Baby jumpers are very popular pieces of baby equipment that allow your baby to get some upright exercise in a safe and protected manner. Active babies sleep better at night, so it is beneficial to allow them to get some exercise during the day so they are ready to go to bed in the evenings. Other names for baby jumpers are Jumperoos, Exersaucers, and Johnny Jump ups. This safe and comfortable play space for your baby promotes both comfort and security while allowing your baby to exercise their leg muscles. There are two soft leaves that extend from the frame that create an attractive canopy that includes several soft toys that hang down in front of the baby so they can bat at them and play. The rotating seat has soft spring covers that prevent the baby from getting pinched. 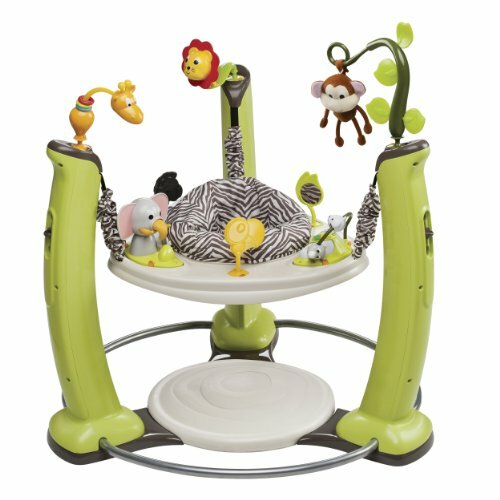 The Fisher Price Rainforest Jumperoo has three height levels that it can be adjusted to depending on the size of your baby. The design of the frame is very convenient, allowing parents to open it from the top and get the baby in and out easily. The seat will rotate a full 360 degrees so the baby can play from every angle of the jumperoo. There are toys at 5 locations around the baby jumper so the baby has something to engage their interest no matter what direction they are facing. There is an electronic toy at the front of the toy that offers music, motion and lights too. They are activated by the baby spinning a little drum or the parent can activate a four minute, continuous play option. Toys include a bobble elephant, a swinging monkey, a parrot hanging from a bead bar, a clear spinning bead ball, a tethered chew toy and a stack of chips that are bright and eye-catching in color. This baby jumper not only allows your baby to exercise and strengthen their leg muscles, it allows them to exercise their minds and motor skills as well. The fact that many of the toys use the baby’s actions to do various things teaches them how to purposely cause reactions with their own movements and actions. This baby jumper pivots to a nesting position so storage and travel is super convenient and easy. It has a weight capacity of 25 pounds and doesn’t require a doorway to use it. The maximum height recommended is 32”. It is made of metal, plastic and polyester and will last a long time with the proper care and cleaning. Requires three AA batteries to work the music and lights features. Evenflo ExerSaucer Jump and Learn is the perfect place for parents to let their babies play and jump in a safe place. No doorway is needed for this brightly colored baby jumper. The rocking, spinning and jumping actions provide plenty of muscle strengthening exercise along with the fun and engaging toys that provide mental stimulation as well. The unique design of the base helps build core strength as well as coordination. There are 58 different activities that can be done with the Evenflo Exersaucer. The soft landing pad is easy on baby’s feet while they jump and rock. Evenflo is a well known and trusted name in baby products and they have continued their focus on quality and innovation with this Jump and Learn Jungle Quest Jumper. Your baby will benefit from the activities and the design of the exersaucer that will help them exercise their legs and core as well as their mind. Another super hit from Fisher Price is the Pink Petals baby jumper. There are tons of activities and fun things to look at in this baby jumper no matter where the baby looks. The spinning seat allows the baby to check out all the toys around him or her. The safe jumping action activates lights, sounds and music. The Fisher Price Pink Petals is for babies that are able to hold their heads upright without propping or assistance. They should not be able to climb out of the baby jumper. The moving and jumping they can do in this Fisher Price Pink Petals Baby Jumper help babies exercise their leg muscles and their motor skills too. There is a variety of textures that the different toys offer to provide all kinds of tactile stimulation for the baby as well. The baby learns that his or her actions cause different things to happen with the toys whether it is flashing lights or music and sounds. The Fisher Price Pink Petals is safer than doorway jumpers or walkers and can be moved around easily to whatever room you are going to be in. Be sure that if you have this in the kitchen, you do not have it anywhere near the stove or counters where the baby can pull things off and onto themselves. Never leave the baby unattended in their baby jumper. The sturdy steel frame has non slip feet that keep it in place, even when your baby is jumping. This baby jumper does not require a doorway and is freestanding. The seat has three height levels for your baby’s comfort. The soft spring covers prevent any potential pinching of your baby’s fingers. The tubes remove from the base quickly and easily so the jumperoo can be traveled with or stored easily. It takes three AA batteries that are not included to make the music, lights and sounds work. The lights, sounds and music can be turned off if the parent desires. Once the baby can support their own head without assistance, they are the perfect age to use a baby jumper. These jumpers provide the baby with exercise for their legs helps them learn balance and also stimulates their minds with the many different activities that most baby jumpers offer. The three top rated baby jumpers featured in this review are all stationary jumpers that do not require the use of a doorway to enjoy. All three of them also offer numerous activities for the baby to engage in including toys they can bat at and things they can do to engage lights, sounds and music too. Any one of them would be a great addition to your baby equipment. Most parents report that their little ones love their baby jumpers. They enable the parents to have a place to let the baby play safely while the parents take care of other things like folding laundry, playing with older children or even cooking dinner as long as the parent is careful to keep the baby jumper away from the stove and counters where they can reach things they can hurt themselves with. A baby jumper is a piece of equipment that has a suspended seat that allows the baby to sit in and jump and bounce. They improve motor skills, coordination, balance and core strength. They also help teach the baby cause and effect since many of the activities involve the baby doing something to get something else to happen such as music starting, lights flashing or some other sound. The best age for using a baby jumper is around 4 month old when they begin to start bearing some weight on their legs on their own. They also can hold their heads up steadily on their own. It is important that you baby get plenty of exercise even when they are young. A baby that engages in physical and mental activities when they are young will sleep better at night and be calmer and less fussy. Exercise is very important for your baby’s health and well being. There are many long term and short term benefits to baby exercise that make it something you should ensure your baby gets. Prevents childhood obesity – Now more than ever before, children are struggling with weight problems due to lack of physical activity. Getting your child in the habit of daily physical exercise is a habit that can stick with them throughout their entire lives. Start off young, with a designated time for physical activity every day. Positive Effects on Cognitive Function – Attention span, memory and other cognitive functions develop early on. Adding appropriate exercise and physical activity will encourage this development. Eat Better, Sleep Better, Better Health – Physical exercise helps babies sleep better and eat better and they will also have better bowel function and health too. These are habits that, when started early and kept up with, will have long term effects into adulthood. Promotes Relaxation, Enhances Mood and Promotes Mental Clarity and Sharpness – You may not know that giving your baby plenty of exercise improves their mood, helps them relax and also promotes mental sharpness. It does help the body too, but there are many mental benefits to exercise that make it something to add in to the day to day routine. There are several different types of baby jumpers on the market. Knowing what your specific needs and preferences are will help you sort through all the choices so you can purchase the one that is going to meet your needs the best. Stationary Jumper – Stationary jumpers have seats with an elastic cord and frame. They pretty much only offer the baby the ability to jump and that is it. Stationary Activity Jumper – Activity jumpers that are stationary have a seat, a frame and a tray, usually filled with toys of all kinds that are attached to the jumper. The toys will vary depending on the brand and design of the jumper. These are great for providing additional activities than bouncing and jumping for your baby to do. Doorway Jumpers – These are simple jumpers with no additional activities. They consist of a seat attached to straps that attach like bungee cables. At the end of the bungee is a clap that attaches to the doorframe. These types of jumpers can only be used in doorways so they are not as popular as they once were with the addition of stationary jumpers that have activities and can be moved around from room to room and even taken outside. There are many different things you should look at when comparing one baby jumper to another. These characteristics will help you narrow down the choices so you have an easier time deciding which one will meet your specific needs the best. Weight limits – Baby jumpers typically have a recommended weight limit that will vary depending on the model you are considering. Choose a jumper that will allow for room to grow since your baby can use the jumper from about 4 months of age until they are walking. Be sure to follow these guidelines to avoid the jumper breaking and posing a potential threat to your baby’s safety. Baby Jumper Seats – The seat of a baby jumper will vary from model to model. Some of the features that jumper seats have include being removable and washable, being lined with plush padding for extra comfort for the baby and being adjustable in height. Most baby jumpers that are stationary offer 3 or more height settings that they can be set at. Storage – There is so much baby equipment, that the ability to be stored easily is a real plus. Many stationary baby jumpers, even the activity models, fold down in a nesting design to allow for easier storage. This also makes them much easier to take with you on trips whether it’s to Grandma’s house for the day or on vacation. 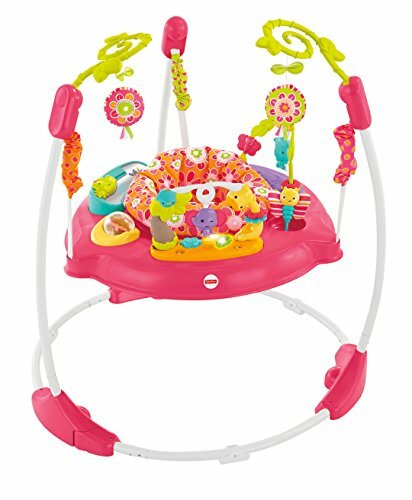 Toys and Activities – One of the great things about the more modern baby jumpers is the offering f toys and activities that they have Sometimes the baby will get tired of jumping, so having these different activities can keep them occupied while you are having to attend to other things. Some activities include lights, sounds and music while others may just have toys to play with. Some of the fancier models have both which offers the baby plenty to do so they don’t get bored. Once you’ve decided that you want to get a baby jumper there are some standard safety tips to keep in mind that will ensure the experience is a safe and enjoyable one for you and your baby. The tips below apply to any type of baby jumper. Don’t use the jumpers that hang from one single cable regardless of whether it attaches to a stand or the doorframe. These are not very stable jumpers and can cause a problem if the baby jumps and gets off balance. Jumpers should never be used near stairways, swimming pools, ovens, stoves or grills, any other area that can pose a hazard to your baby. You baby should never be in a jumper, regardless of whether it is a doorframe jumper or a stationary activity jumper, alone and unattended. Never leave the room while the baby is in the baby jumper. Don’t attach any toys with strings or that already has strings. These strings can pose a strangulation hazard to your baby. Once your baby reaches the height and height recommendations, stop using the jumper so no injuries occur. If the jumper is damaged or broken in some way, do NOT use it. Check the Consumer Product Safety Commission’s website for recall information before purchasing a specific baby jumper. It is not advisable to purchase used jumpers, but if it is stationary and in excellent condition, you should be able to use it with care, without any issues. Make sure to clean and sanitize it first. If you have to move the baby jumper to another room, remove the baby from the seat first and then move it. It may seem inconvenient, but moving a baby jumper with the baby in it can result in injury. Although doorway jumpers are not as safe as stationary, frame style baby jumpers, many people still love to use them. Follow these tips that are specific to doorway jumpers. The doorway that you will be attaching the jumper to needs to meet all specifications. Not all doorframes will be able to support the jumper with the clam. Adjust the baby jumper height to the right size of the baby. The baby’s toes shoes touch the floor when the jumper is at the right height. Before putting the baby in the jumper, be sure to inspect it for cracks, problems or defects of any kind. Don’t leave the jumper in the doorway when it is not in use. Never push the baby in the jumper as if it were a swing. When your child is in the doorway jumper, be sure there are no loose pets around that can run through the doorway and knock the baby into the side of the doorframe. Limit jumping time to 15 minutes so the baby doesn’t become nauseous. Use the jumper before meals and snacks to avoid spitting up. Baby jumpers are a great way to provide exercise for your baby at a crucial time in their growth. Overall, the stationary jumpers are best, providing your baby with safe exercise as well as mental engagement in the form of the toys and interaction they can have with music, lights and sounds. The top rated baby jumpers reviewed are all models to consider when you are looking for a baby jumper. With their popularity and features, they will more than likely have everything you are looking for in a baby jumper.